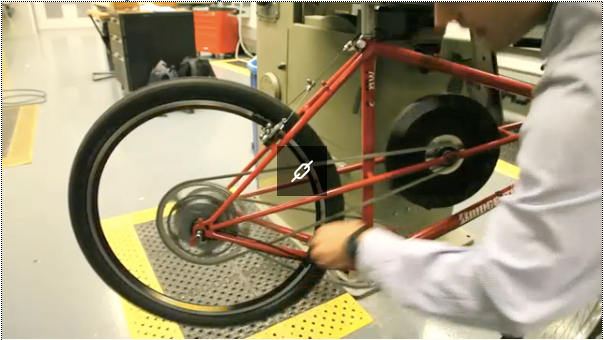 Inventor Maxwell von Stein has created a bicycle using a NuVinci 360 hub with a chain ring adapter connecting the power output of the hub to a flywheel. This allows the rider to aid in braking by first shifting so that power is transferred from the bicycle wheel’s motion and transferred to the flywheel. Then when a boost is desired (when trudging uphill perhaps?) 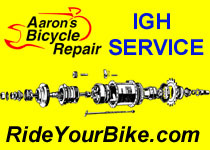 shifting in the other direction will transfer the power from the flywheel to the rear wheel. Cool! Using the NuVinci continuously variable transmission, the rider is able to smoothly transfer energy to and from the flywheel by shifting up or down.